Goal: Heat a nichrome wire loop to sterilize it prior to inoculating cultures or streaking agar plates. Nichrome wire inoculating loop loops made out of other metals may not tolerate multiple cycles of re-heating. 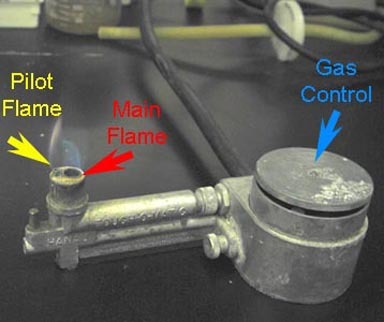 DO NOT PLACE PLASTIC LOOPS IN THE BUNSEN BURNER. Make certain the bunsen burner has been lit. 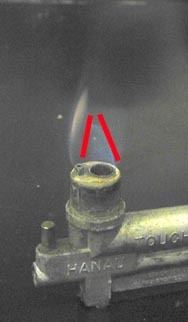 With the model shown in the above figure, a small pilot flame (yellow) is adjacent to the larger flame of the burner (red arrow). Though smaller than some lab-style burners, this size flame is more than adequate for sterilizing inoculating loops. The flame is exceedingly hot, so be certain to keep your hands and any clothes or other flammable items clear. 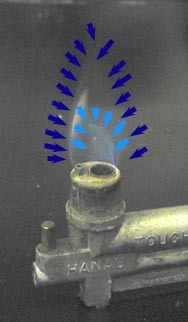 Note the dual blue cone on the flame. The left-most picture has outlined the inner light-blue cone, which is hotter, and the outter dark blue cone. The hottest region of the flame lies in the interface between the light and dark blue cones. The image on the right outlines this area with two red lines. Place the inoculating loop in this region. 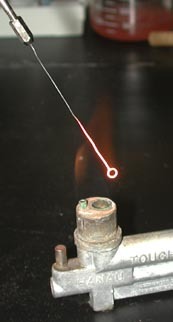 As demonstrated above, the nichrome loop rapidly glows when placed in this region. It should take no more than a few seconds. If not, check that the Bunsen burner is lit. Once the loop flames red, you have killed any microorganisms that may have contaminated the loop. You now have a sterile loop.